In a dry pan roast cardamom, cloves, cinnamon stick, aniseed, fennel seed, red chilli . Blend it to a powder & keep it aside. Heat oil in a pan, add mustard seed, cashew nuts,chopped onion, ginger garlic paste & saute few mins. Add chopped tamoto allow to cook well. Add ground masala powder and allow it to cook. cook until the raw flavours extrac & add boiled rice.mix well. Serve hot with any Raiths or pappad or chips. 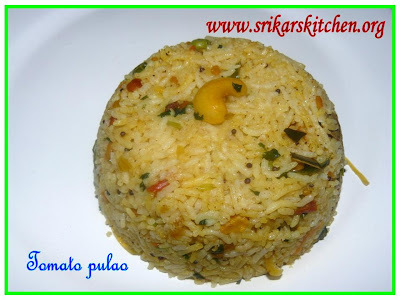 Welcome to RM.Pulav looks delicious. Romba azhaga iruku paaka Sripriya..
Yummy tomato pulao...happy to see u in RM#2 Sri..very glad to run with u..
Lovely pulao Srikars :). Lovely pic and very tempiting looks. good one to try out. 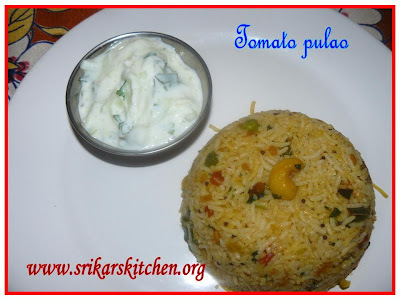 I love tomato rice.. i follow a different method.. must try yours. Pulao looks really tempting. Nice picture. looks yumm..good going with the marathon..
very yummy and tempting picture. hey great to run with you in RM..Pulao looks delicious!! Welcome to Rm...pulav looks great..and you can send it for the Rice mela too! They look too good! This is comfort food fr me. very nice platter of rice and raita.